What does it take to lead the successful turnaround of four consecutive organizations? What does it take to run a $5 billion business in Detroit as the city struggles to emerge from municipal bankruptcy and its worst ongoing crisis ever? What does it take to be a female CEO who has come up against discrimination and personal attack? It takes "Unconventional Leadership," a style of leadership based on confronting reality and leading headlong through adversity. 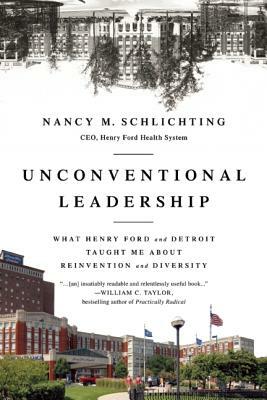 In this inspiring story, innovative LGBT leader Nancy Schlichting, the CEO of Henry Ford Health System, reveals her unique strategies that drive success: maintaining a focus on people, creating a culture of innovation and reinvention, and embracing diversity as a key strategy for growth. The book describes a leadership paradigm that will motivate, inspire, and drive new thinking in today's disruptive business environment where traditional modes of managing are no longer working. In "Unconventional Leadership," Schlichting weaves together three themes that explain how she has become one of the most powerful individuals in healthcare today: (1) deftly conquering the immense challenges within the healthcare industry itselfconsolidation, new models of delivery and financing, increasing government regulation and oversight, changing customer expectations, and pressures on cost and quality (2) the exciting and panoramic backdrop of Henry Ford and DetroitFord's legacy of invention and innovation combined with ongoing attempts to restore and renew a city in deep decline; and (3) forging a career path and excelling as an LGBT and female CEO in a world typically dominated by men. An abiding fan of the underdog, Schlichting reveals, above all else, the sheer grit and determination required to lead through adversity and create a successful legacy of leadership. Nancy M. Schlichting is Chief Executive Officer of Henry Ford Health System, a nationally recognized $4 billion health care organization with 23,000 employees. She is credited with leading the health system through a dramatic financial turnaround and for award-winning patient safety, customer service and diversity initiatives. Schlichting joined Henry Ford Health System in 1998 and in 2003 was named President and CEO. Her vision is to create tremendous clinical excellence, a fabulous patient experience, and a great environment for all health care professionals to advance their careers. Schlichting believes that great people are the key to providing great health care, and therefore, is committed to giving her employees everything they need to become the best possible health care professionals. A hallmark of Schlichting s career is working with community, legislative and business leaders to improve health services while providing affordable care. Nancy serves on numerous community, professional, and corporate boards that reflect both her professional and personal interests. She is a member of The Kresge Foundation Board, Walgreen Company Board, Federal Bank of Chicago Board Detroit Branch, Detroit Regional Chamber Board, Greater Detroit Area Health Council Board, Citizen s Research Council of Michigan, Detroit Economic Club Board, Downtown Detroit Partnership Board and United Way of Southeastern Michigan Board. Nancy is also a member of the American College of Healthcare Executives and the Michigan Women s Forum. Nancy has an exceptional ability to balance her service to the community with her own exemplary career that has resulted in many forms of recognition over the years. Among her most recent honors, Nancy was named for the second time one of the Top 25 Women in Healthcare by Modern Healthcare magazine, Becker s Hospital Review named Nancy one of its Women to Know in Health Care, and Crain s Detroit business named her one of 16 Women to Watch. Schlichting received her A.B. from Duke University and her M.B.A. from Cornell University. She and her family reside in Bloomfield Township, Michigan."